Sicille Kotelawala, who was involved in the infamous Golden Key financial scam, and was absconding from police, was arrested today by immigration officers at the Bandaranaike International Airport, upon her return to Sri Lanka. Sicille Kotelawala, who is the wife of Lalith Kotelawala, has been in Sri Lanka’s wanted list in connection to the financial scam amounting to billions of rupees at the Golden Key company. Soon after her arrest, she was handed over to the Criminal Investigations Department (CID). She fled the country in 2008 and was reportedly living in the United Kingdom. One more to the Dog pound ! Actually Cicille should go to the temple and see a priest and perform some Sil as a last resort. May be YR who is already in welikada jail could show her the ropes in handling the stint in jail. anyway, Ciclle will only suffer in comfort in an air conditioned hospital with a perpetual fictitious sickness that only she knows about. කොළඹ නගරයේ නිවාස 118,780ක් අතරින් විදුලි බලය නොමැති නිවාස 3822ක් තවමත් එළිය වන්නේ කුප්පි ලාම්පුවලින් බව කොළඹ මහනගර සභාවේ 2016 අයවැය ලේඛනය උපුටා දක්වමින් ලංකාදීප මුද්‍රිත පුවත්පත 2016 ජනවාරි 16දා වාර්තා කළේ ය. කොළඹ නගරයේ නිවාස අතරින් විදුලි බලය ඇත්තේ නිවාස 118,780කට පමණක් බව වාර්තාව පවසයි. එම වාර්තාව අනුව, විදුලි බලය නොමැති නිවාස වැඩි ම ප්‍ර‍මාණයක් ඇත්තේ කොළඹ ප්‍රාදේශීය ලේකම් කොට්ඨාසයේ ය. එහි නිවාස 2898කට විදුලි බලය නැත. තිඹිරිගස්යාය ප්‍රාදේශීය ලේකම් කොට්ඨාසයේ නිවාස 924කට විදුලි බලය නොමැත. වර්තමානයේදී මෙගාපොලිස් හා බස්නාහිර පළාත් සංවර්ධන ඇමති ධුරය දරන චම්පික රණවක මහතා 2011දී පෙන්වා දුන් පරිදි මෙරට විදුලිය පහසුකම් නොමැති පවුල් වැඩි සංඛ්‍යාවක් ජීවත් වන්නේ කොළඹ නගරයේ ය. “දිදුලමු ලංකා”ව්‍යාපෘතිය යටතේ 2016 වසර වන විට සෑම නිවසකටම විදුලිය ලබා දීමට සැලසුම් කර තිබුණත්, තවමත් එම අභියෝගය ජය ගැනීමට හැකි වී නැති බව කොළඹ නගර සභාවේ අයවැය වාර්තාවේ තොරතුරුවලින් පෙනේ. Much of the Hindu epic, the Ramayana, is set in Sri Lanka. But the island has seen something of a modern epic in the past year or so, with the crashing fall from grace of the family which once appeared to run most aspects of life there. Once Mahinda Rajapaksa lost the presidency a year ago, his successor set about unravelling the network of power the Rajapaksas had built. In the latest examples, this week the former president's wife was questioned over corruption allegations, and one of their sons was arrested over suspected money-laundering, as the BBC's Charles Haviland reports. Hours after the arrest of his son, Yoshitha, a photographer caught the ex-president with eyes full of tears, attacking the money-laundering charges as acts of revenge against him and his family. The picture showed how starkly the fortunes of this once invincible clan have tumbled since Mr Rajapaksa senior was ousted from office early last year. He, his two once-powerful brothers - one of whom controlled defence and the other the economy - and his wife and two of his sons have now all been either detained or questioned on a long list of charges including weapons offences, all of which they deny. Many in the Sinhalese majority revered Mr Rajapaksa for crushing the 30-year Tamil separatist insurgency, notwithstanding the massive civilian casualties that caused such outrage among human rights advocates. Over 1,500 proposals have been submitted to the Public Representation Committee on Constitutional Reforms (PRCCR), Chairman, attorney-at-law Lal Wijenayake said. This was the total number submitted as far as written submissions via mail, email, fax, social media, personally handed over to the Secretariat and at the public sittings in the four districts in 12 days. “There was a lack of youth representation at all the sittings. The Committee would like to see an increased participation of youth,” he said, adding that the only significant youth participation was in Matale,where a group of schoolchildren made their submissions. The PRCCR hopes to hold extra sessions for youth to submit proposals next month, as the public sittings will be completed by the end of this month. “Since the Committee has not scheduled for next month, we should allocate more time for youth. Other citizens who missed the opportunity during the scheduled public sittings could also hand over their proposals during this time,” he said. Apart from the public proposals, the PRCCR sought proposals from religious leaders and reputed scholars. The next hearing scheduled for two days, starting tomorrow ( will be held in Galle, Kegalle and Kilinochchi. The 20-member PRCCR is divided into three panels and will hold public sittings in three districts. පසුගිය පාලන යුගයේදී රාජපක්ෂවරුන් සමග ළැඳිව කටයුතු කරමින් අධිකරණ අමාත්‍යාංශයේ ලේකම් ධුරය පවා හොබවන ලද, ස්වාධීන පුද්ගලයකු යැයි සැලකිය නොහැකි සොලිසිටර් ජෙනරාල් සුහද ගම්ලත් මීළඟ නීතිපතිවරයා ලෙස පත් කළ යුතු බවට අධිකරණ අමාත්‍ය විජයදාස රාජපක්ෂ ආණ්ඩුවෙන් දැඩි ඉල්ලීමක් කරමින් සිටින බව වාර්තා වේ. අමාත්‍ය විජයදාස රාජපක්ෂගේ මෙම ඉල්ලීමට අග‍්‍රාමාත්‍ය රනිල් වික‍්‍රමසිංහ මෙන්ම එක්සත් ජාතික පෙරමුණ නියෝජනය කරන අනෙකුත් කැබිනට් අමාත්‍යවරුන්ද බොහොම යක් විරුද්ධත්වය ප‍්‍රකාශ කර ඇතැයි වාර්තා වේ. එසේ වුවද ජනාධිපති මෛත‍්‍රීපාල සිරිසේනද සුහද ගම්ලත් මහතා එම තනතුර සඳහා පත්කිරීමට කැමැත්තක් දක්වන බව දැනගන්නට ලැබේ. දහනව වැනි ආණ්ඩුක‍්‍රම ව්‍යවස්ථා සංශෝධනය අනුව නීතිපතිවරයා පත්කිරීම ව්‍යවස්ථා සභාවේ අනුමැතිය සහිතව ජනාධිපතිවරයා විසින් සිදු කළ යුතු අතර, ජනාධිපතිවරයා විසින් ව්‍යවස්ථා සභාවට යවනු ලබන නම් තුනක් හෝ ඊට අඩු සංඛ්‍යාවකින් එක් පුද්ගලයකු එම සභාව විසින් පත්කිරීම සඳහා නිර්දේශ කර ජනාධිපතිවරයාට යැවිය යුතුය. නව නීතිපතිවරයා පත්කිරීම සම්බන්ධයෙන් ශ‍්‍රී ලංකා නීතිඥ සංගමය, ජනධිපතිවරයා හමුවී සාකච්ඡා කර ඇති අතර, ඒ සම්බන්ධයෙන් නීතිඥ සංගමයේ ලේකම් නීතිඥ අජිත් පතිරණ මහතාගෙන් කළ විමසීමකදී පැවසුවේ නීතිපති තනතුරට පුද්ගලයකු පත් කිරීමේදී ජ්‍යෙෂ්ඨත්වයට මුල් තැන දිය යුතු සේම නීතිපති දෙපාර්තමේන්තුවේම අයෙකු පත් කළ යුතු බවට ජනාධිපතිවරයාට දැනුම් දුන් බවයි. ඒ අනුව සුහද ගම්ලත් මහතා එම තනතුරට පත්වීමේදී ඔහුගේ විශ්වසනීයත්වය පිළිබඳව ගැටලූවක් පැන නඟින බවට කරන ලද විමසීමේදී අජිත් පතිරණ මහතා පැවසුවේ ගම්ලත් මහතාගේ විශ්වසනීයත්වය පිළිබඳව ප‍්‍රශ්නයක් තිබෙන බවයි. ඊට හේතුව ලෙස ඔහු දැක්වූයේ නීතිපති දෙපාර්තමේන්තුවේ සිට අමාත්‍යාංශ ලේකම් ධුරයක් දැරීම සඳහා ඔහු පසුගිය කාලයේ යෑමය. එසේම ඔහු පැවසුවේ ජ්‍යෙෂ්ඨත්වය නොසලකා අදාළ පත්කිරීම කරන්නේ නම් එය සාධාරණය කළ හැකි තර්කයක් ඉදිරිපත් කළ යුතු බවයි. සුහද ගම්ලත් මහතා නීතිපති තනතුරට පත් කළ හොත් එම දෙපාර්තමේන්තුවේ විශිෂ්ට නිලධාරීන් දෙදෙනෙකු වන ජයන්ත ජයසූරිය හා කපිල වෛද්‍යරත්න යන අය එම දෙපාර්තමේන්තුව හැර යෑමේ අනතුරක් පවතින බවද තවදුරටත් වාර්තා වේ. මේ පිළිබඳව අමාත්‍ය විජයදාස රාජපක්ෂ මහතාගෙන් කරුණු විමසීම සඳහා ඔහු දුරකථනයට සම්බන්ධ කර ගැනීමට උත්සාහ කළද එය ව්‍යර්ථ විය. කරුණාකර ඔබතුමාගේ ජනරාල් පදවියට තිබෙන කීර්තිය නැතිවෙන වැඩ කරගන්න එපා. That is something I am concerned too. ( Seen lately Otara of ODEL fame is showing more concerns about the environment than before. Such people should be roped in, if they want real guys / gals who can walk the talks also. Not just NATO boys like Harsha and them ). Rana wrote: කරුණාකර ඔබතුමාගේ ජනරාල් පදවියට තිබෙන කීර්තිය නැතිවෙන වැඩ කරගන්න එපා. Or should we hang Bawa ? 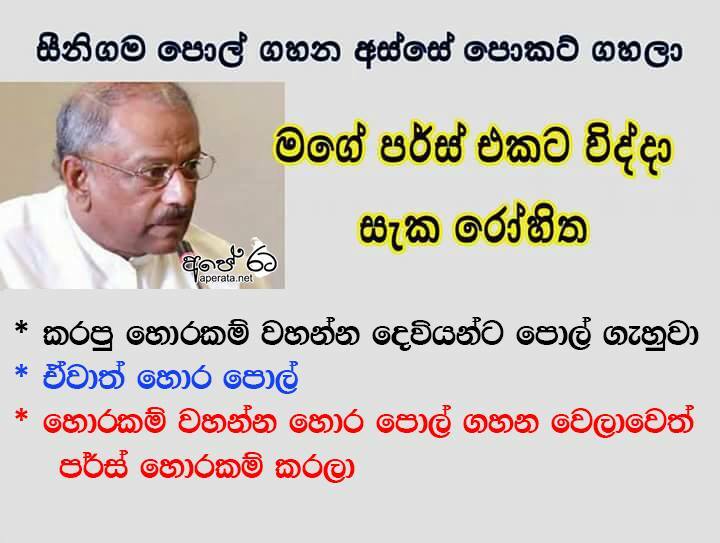 කිත්සිරි ද සිල්වා wrote: That is something I am concerned too. I agree with this. I endorse the statement made by an analyst a while ago saying " SF is a military genius but a Political dumbo" . His political acumen proved wrong once again in last August election by deciding to contest alone in the last minute, where he exposed and humiliated badly. Now this is a smart political move by RW, as the MR/GR gang just started their political propaganda as so called saviors of war heroes. SFs arrival imposes a real threat for them and dent their slogans considerably. Controversial Sri Lankan Army officer and former Rajapaksa government stalwart Bandula Weragama was appointed as the General Manager Airport & Ground Services at SriLankan Airlines a short while ago. CEO Suren Ratwatte gathered all senior managers of the airline earlier today in Katunayake to make this official announcement. ” I have selected the best candidate from those that had applied for the post” CEO Ratwatte said. Other experienced airline professionals who were overlooked were Ajith Fernando, Yohan Pathirane, Janaka Munasinghe and Shiran Perera. Weragama waltzed into the airline directly from the Sri Lanka Army during the Rajapaksa regime’s reign and went on to be appointed the Head of In Flight Services, with no prior airline experience. I trust you must be busy consolidating the existing bonds between our nations, for which I am indeed thankful. I wish to bring to your immediate attention, an add for employment in your Official website- for the post of Defense Support Officer. Your Office has clearly stated that a candidate must be fluent in reading and writing in Sinhala language. As this job deals with the Tri -services ( Army, Navy and Air Force) is your HC trying to then imply that the Staff officers working in the forces of my Country dont have sufficient language skills in English ?? Britain has cheered and applauded us for singing the National Anthem a few days ago in Sinhala and Tamil, and now you respond in this manner. One must indeed practice what they preach. මෘග රාජපක්ෂ පවුලට රාජකීය ගබ්සා වෙදෙක් ඉඳලා..! මැදමූලන මෘග චෞර පාලන සමයේ රාජපක්ෂ පවුලට රාජකීය කේන්දර කාරයෙක් සිටියා මෙන් රාජකීය ගබ්සා වෛද්‍යවරයෙක්ද සිට ඇති බවත් පාදෙනියලා මුරුත්තෙට්ටුවේ ආනන්දලා ඔහුව ආරක්ෂා කර ඇති බවත් සාක්කි සහිතව ලංකා ඊ නිව්ස් අභ්‍යන්තර තොරතුරු සේවය හෙලිදරව් කර සිටී. රාජපක්ෂ මෘග චෞර සමයේ ඒ අනුහසින් රජයේ වෛද්‍ය සංගමයේ පාදෙණියලා දොස්තර මොනික් ලා සමග වකුගඩු ජාවාරමේ පමණක් නොව රන්දෙනිය නම් රාජකීය ගබ්සා වෛද්‍යවරයා සමග ගබ්සා ජාවාරමේ ද යෙදී ඇතැයි ද ලංකා ඊ නිව්ස් අභ්‍යන්තර තොරතුරු සේවය වෙත වාර්තා වේ. පාදෙණිය ගැන අමුතුවෙන් කිවයුතු නොවේ. lankaenews වෙබ් අඩවිය කියවන ඕනෑම කෙනෙක් ඔහු ගැන දන්නා බැවින් රාජකීය ගබ්සා වෙදනා ගැන හෙලිකරමු..
රන්දෙනිය යනු කොළඹ ද සොයිසා කාන්තා රෝහලේ නාරිවේද මහාචාර්ය සිරිල් රන්දෙනිය යි. ඔහු රාජපක්ෂ පුතුන්ගේ නිල ගබ්සා වෙදැදුරා ලෙස පසුගිය සමයේ කටයුතු කර ඇත. 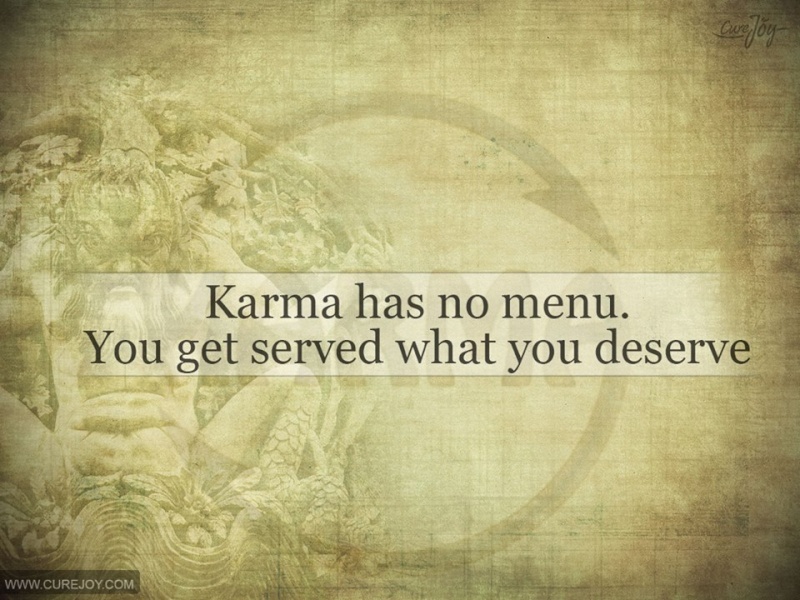 Karma Never Loses (Any) Address ! "The soldiers got hold of their former commander by his hands and legs and dragged him along the floor. Sarath Fonseka kept on shouting and struggling as he was forcibly dragged down the steps from the first floor"
I will duck this issue as I have many friends from all the major communities in Sri Lanka and abroad. Lets try and fix our present system instead of raving about by-gones! කිත්සිරි ද සිල්වා wrote: "The soldiers got hold of their former commander by his hands and legs and dragged him along the floor. 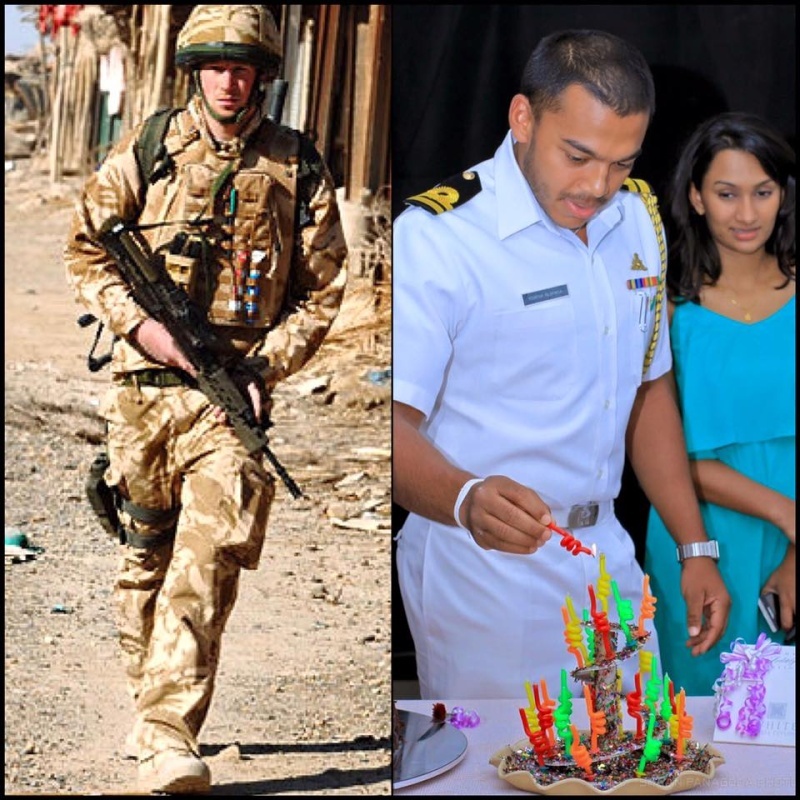 On left, Prince harry on the battle field in Iraq etc. In which battle field our prince has served ? The funny thing is while he was training all of his career in UK and other countries, they are screaming against "පර සුද්දා ". At least he should have trained in China or Libya. Hal seru theyka thena amma 1970 gannan wala apata gam pasalwalata yannna siddthewuna. Namuth, Sirimavoge du-Daruwo engalanthe giheen iganagatha suddan Ekala. Those who were born only yester year cannot get my figure of speech correctly. They need a person like Colvin De Silva or Thampo to inform them what they achieved with the trade unions. Why should they HUNT for the drowned girls or is this their usual reaction!